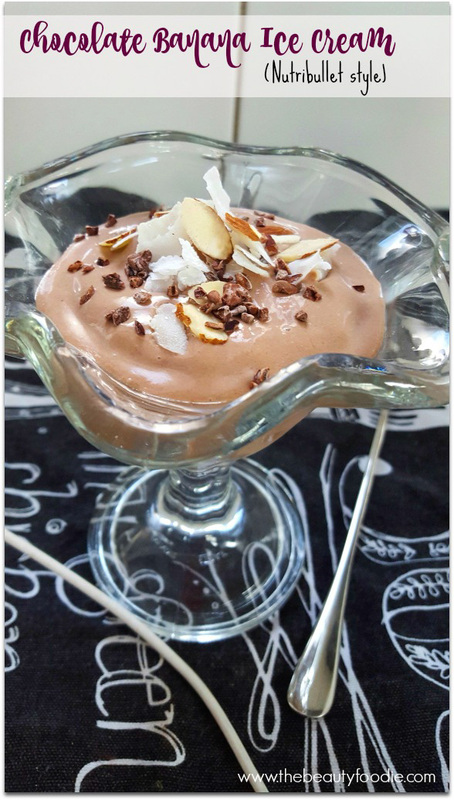 Anyhoo, one of the tasty treats I’m really enjoying whipping up in my Nutribullet is ice cream. I’ve always got a stash of frozen bananas in the freezer as my local greengrocer gives them away once they’ve started to “turn a bit manky” and I snap ’em up. What can I say? I’m an opportunist. 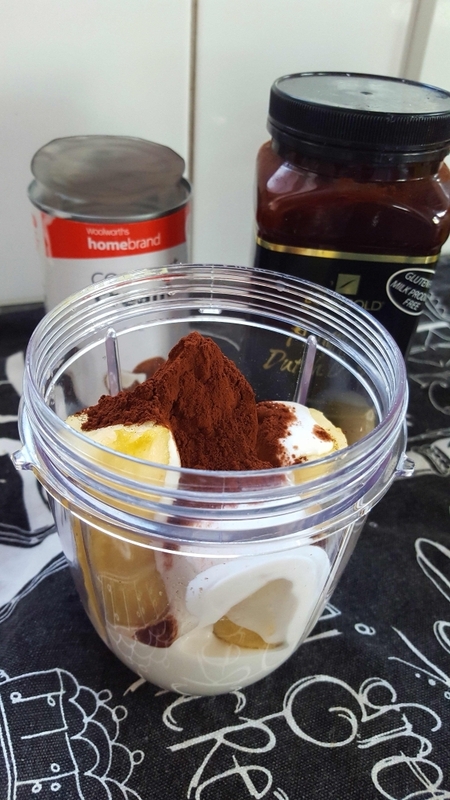 Frozen bananas are amazeballs as these lend themselves superbly to be whipped to smithereens for smoothies and now, I’ve discovered, – ice cream. I’ve played around with a few flavours and my favourite, hands down, is chocolate banana. It’s such a simple dessert and that it’s guilt free on the account of no refined sugar (yeah, I’m still on my reduced sugar soap box). Dairy free peeps will be ALL OVER THIS too. Frankly, what’s not to love? Sometimes, a touch of sweetness: Think up to 1 teaspoon of honey, maple syrup or stevia (depending on how sweet the fruit is that you’ve used). Note, if I’m using frozen bananas I skip the ‘touch of sweet’ as bananas are plenty sweet enough. I use the short Nutribullet cup (500ml). Pack the cup full of fruit (nearly to the top). Then add milk (about 1/4 to 1/3 of the way up the cup), followed by any sweetness (optional, see above). Blend. 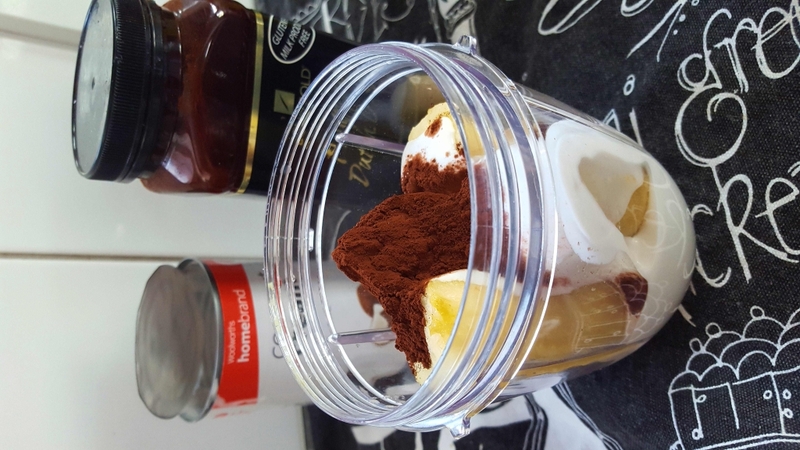 But here’s the important bit: Don’t overblend, otherwise you’ll end up with a thickshake! I’ve learnt the hard way that you need to pulse the Nutribullet very quickly for about two seconds, then remove the cup and shake it (I tap it on the bench for good measure, so all the fruit dislodges and moves to the blades at the bottom of the cup). Repeat this step up to two or three times to get a tip top ice cream consistency (Tip Top – get it? See what I did there?). Basically you want to just blend the ingredients, not turn them into a liquid. Note: Even the accidental milkshake ice creams are yummy, so don’t beat yourself up if you get a bit carried away with your blitzing. You can just drink it and save time. Thumbs up! I need to rave, once more, about Equagold’s Premium Dutch Cocoa. Oh. Oh yes. The combos you can use for Nutribullet ice creams are endless. We’ve been enjoying blueberry ice cream (frozen banana, frozen blueberry and a touch of honey); Mango (frozen mango, frozen peaches, coconut cream, drizzle of maple syrup); I’m not a lover of anything strawberry flavour (I know, I know, I’m missing out) however my nine year old is telling me to mention that the Banana & Strawberry ice cream is, and I quote, “the schizzle”. This contains frozen banana, frozen strawberries, vanilla, coconut cream and maple syrup. What’s my favourite? Chocolate banana ice cream. There’s no contest. Add coconut cream and cacao powder. Blend by pulsing for two seconds then remove the cup and shake it (I tap it on the bench for good measure, so all the fruit dislodges and moves to the blades at the bottom of the cup). Repeat this step up to two or three times to get the perfect consistency. Place into a serving dish. Add ice cream toppings, if using. Have you tried Nutribullet ice cream? What combo gets the thumbs up in your home?